FujiFilm's Z5fd is a good-quality, 6.3-megapixel digital compact with some caveats. Its main asset is its super-slim size, which you hardly notice in your pocket. Some features have been lost to make the camera so slim, such as a practical zoom range. It's available in regular silver and black, but more commonly advertised in raspberry red, mocha, and a few other trendy, TV makeover-style colours. Underneath the sugary facade is a camera that can still take a good picture in daylight and night, and it does especially well in low light thanks to Fuji's SuperCCD HR sensor. The Z5 uses a sliding lens cover as an on/off switch. This kind of feature is not as popular as it once was, but it still feels slick to play with. Around the back is a bright 2.5-inch LCD screen, which is covered with a few millimetres of anti-reflective coating. This screen has a decent resolution and great colour representation. The controls and buttons are all soberly designed and well placed. The menu system of the camera's software, as with all current Fuji compacts, is an exercise in simplicity. You'll be setting the camera's exposure settings or fluffing about with your white balance slides in no time. The Z5 lacks any real flexibility to zoom in and out, and it has no panorama feature. Its tiny lens only has a 3x optical zoom (6x digital), which is rather weak, but as a point-and-shoot camera this won't matter too much. On the downside, the battery doesn't seem to hold its charge for long; perhaps the battery has been reduced in capacity to fit in the body. The anti-reflective coating also raises above the camera's body and can therefore attract scratches. However, these points don't matter too much - this camera's buyer is probably looking for something that's light to carry in a handbag, trendy-looking, and capable of taking good night-time pics. 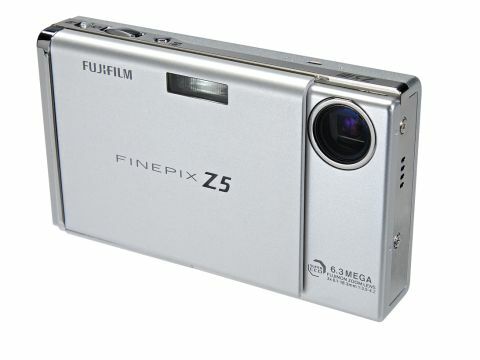 The FinePix Z5fd is exactly that.